Think it can’t happen to you? It happens all the time. Jail and so called legal investigations which often take place for no valid reasons are how government and police terrorize the public. What would happen to your home, car and family if you were innocent but accused and locked away for 258 days? 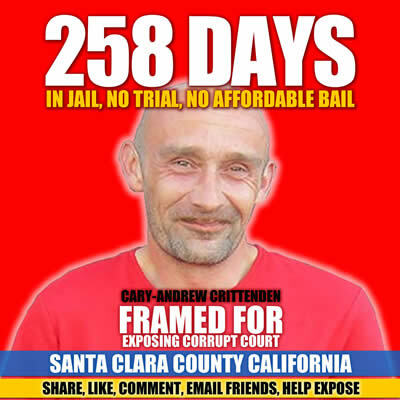 This happened and is still going on for Cary-Andrew Crittenden by the Santa Clara County District Attorney office. With the help of two police officers who apparently have made up their own facts via their own police reports. More on Santa Clara County Prosecutor Barbara Ann Cathcart who has a history of victimizing people at tax payer expense. SEE HER STORY regarding Henry Sires. This is common and what happens to anyone who exposes police, judges or government who break the law or commit crime. The problem is who prosecutes the prosecutors? The other issue is when one person commits perjury everyone within that department or government sector ignores it. Courts and police are out of control abusing their power and terrorizing people to stop them from exposing corruption. While America and the media has it’s attention on Syria more people in America are being terrorized than ever.